Encore, encore! 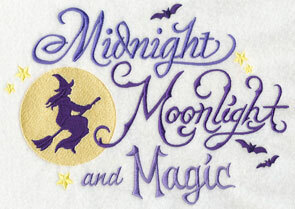 It's a spooky-scary embroidery encore with frightfully colorful and creative designs. 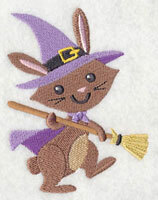 Stitch these Halloween treat on trick-or-treat bags, towels, and table linens. 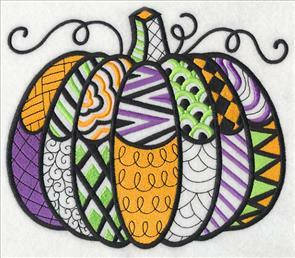 New Halloween blackwork motifs bring a fashionable and eye-catching look to your projects. 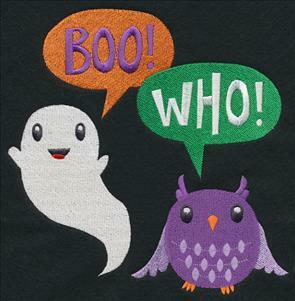 Sweet-yet-spooky trios are terrific on sweatshirts and t-shirts. 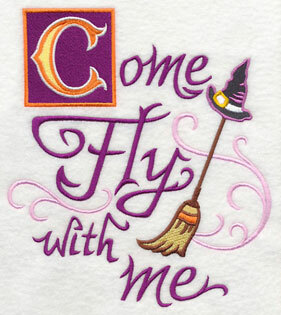 Plus, fang-tastic Halloween sayings are fun and fabulous additions to pillows, totes, tea towels, and more! 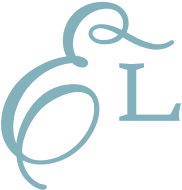 Scroll down the page to see fabulous designs! 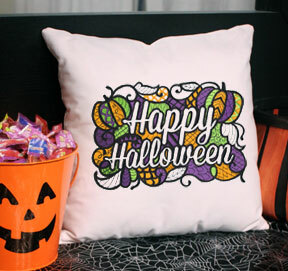 Dress up your home with a spooktacular look! These new designs are wonderful on throw pillow, tea towels, and more. 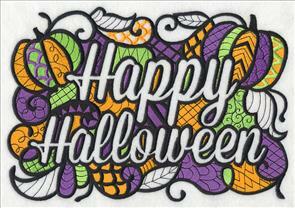 Add a haunting note to pillows, tote bags, and more with a blackwork "Happy Halloween" design. 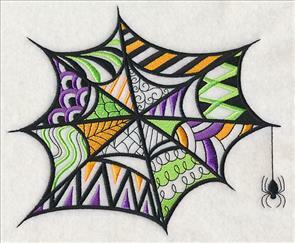 Bright orange, green, purple, and black give this intricate design the colors of the season. 9.82" x 6.91" and 7.81" x 5.50" and 6.89" x 4.85"
Trick or treat! Colorful candy fills the background of this vibrant Halloween motif. 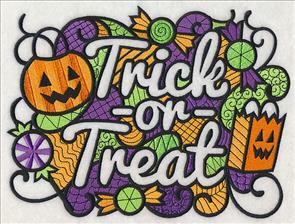 A trick-or-treat bag and a pumpkin bucket adorn the eye-catching blackwork design. 9.14" x 6.90" and 7.78" x 5.88" and 6.48" x 4.90"
A friendly ghost says hello in this fun and colorful design. 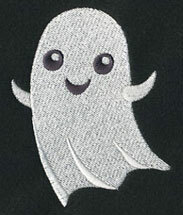 White areas in blackwork designs are not filled in; the background fabric will be visible. 9.73" x 6.91" and 7.82" x 5.55" and 6.85" x 4.86"
Each opening in these blackwork designs features a different pattern or drawing for a unique and striking appearance. 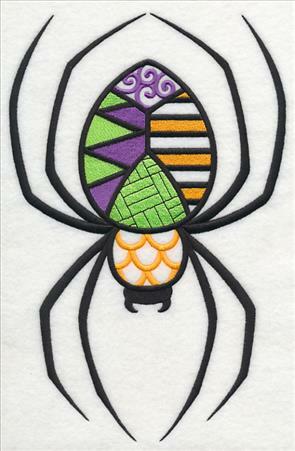 The pumpkin and spiderweb below are particularly arresting on pillows, tote bags, wall hangings, and more. 7.82" x 6.79" and 6.76" x 5.87"
7.79" x 6.54" and 6.95" x 5.84"
5.75" x 4.83" and 3.88" x 3.26"
Framed embroidery pieces are a classic and sophisticated way to highlight favorite designs and motifs. 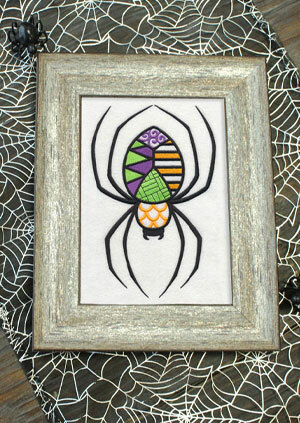 Designs like this blackwork spider are particularly fun options because the white space allows the embroidery to shine. one piece of cutaway stabilizer. Frame and display to add a fabulous look to your Halloween decor! 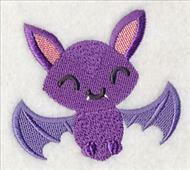 6.87" x 10.58" and 5.86" x 9.03"
5.07" x 7.80" and 4.48" x 6.88"
Stitch a boo-tiful bat with wings outstretched on trick-or-treat bags, Halloween decor, or apparel. 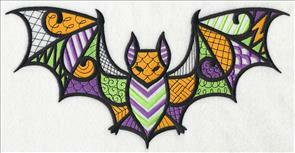 Pair it with one of the other Halloween blackwork designs above, or stitch singly for extra impact. 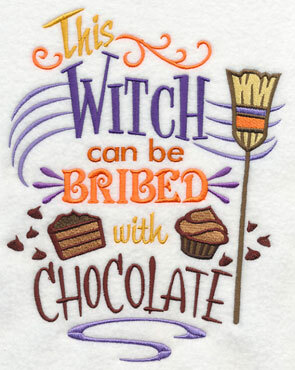 11.75" x 5.86" and 9.41" x 4.69" and 7.81" x 3.90" and 6.87" x 3.43" and 3.86" x 1.94"
Chocolate lovers will love this fun, bewitching saying! It's a fabulous addition to tea towels, aprons, and other kitchen gear. 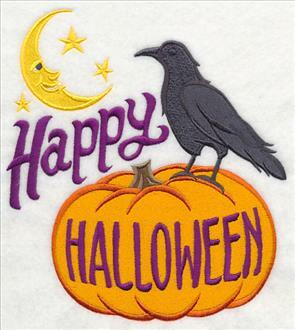 6.90" x 8.71" and 5.85" x 7.39"
4.88" x 6.16" and 3.06" x 3.86"
Classic October 31 accents -- like pumpkins, bats, a raven, or a black cat -- add traditional Halloween flair to these de-frightful sayings. Stitch on tote bags, pillows, or mini-quilts. 9.76" x 6.91" and 7.82" x 5.54"
6.91" x 7.68" and 5.86" x 6.51"
4.86" x 5.40" and 3.36" x 3.88"
Embrace your inner witch with a pair of wickedly fabulous Halloween sayings. 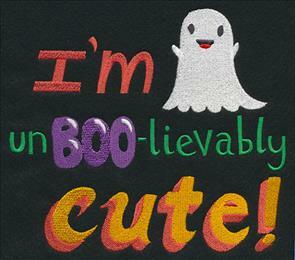 They're boo-tiful additions to quilts, pillows, tote bags, and other seasonal decor. 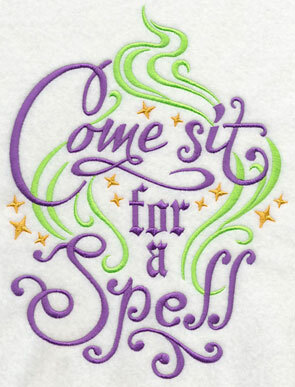 9.71" x 6.91" and 7.80" x 5.55"
6.92" x 7.78" and 5.87" x 6.60"
4.86" x 5.47" and 3.47" x 3.90"
Cast a spell on your loved ones with this spine-tingling design. 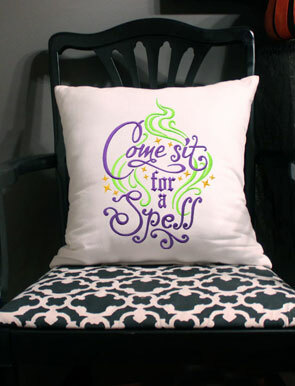 It's the perfect way to invite friends and family into your home -- stitch on pillows, welcome flags, and more. 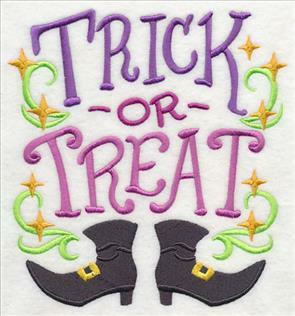 6.91" x 9.09" and 5.86" x 7.71"
4.89" x 6.44" and 3.03" x 3.87"
Pull out your black pointy hat for Halloween this year! 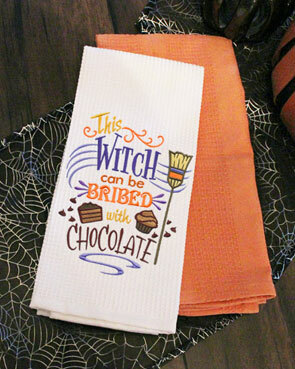 Sweet-yet-spooky designs featuring positively witchy sayings are chic additions to tote bags, towels, pillows, and other seasonal projects. 8.89" x 6.85" and 7.62" x 5.87"
10.06" x 6.91" and 8.59" x 5.90"
7.81" x 5.37" and 6.86" x 4.71"
"Trick or treat, smell my feet, give me something good to eat!" These fun (and fun-ny!) 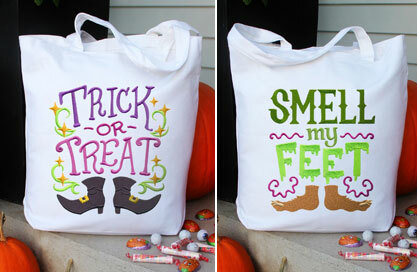 Halloween designs bring the classic October 31 saying to life with a pair of witch's boots and monster feet. 6.91" x 7.31" and 5.86" x 6.20"
6.41" x 7.31" and 5.43" x 6.20"
4.51" x 5.15" and 3.38" x 3.86"
Use these too-cute-to-spook designs as embellishments for the coolest trick-or-treat bag on the block! A trio of cute birdies are all dressed up and ready for Halloween night! 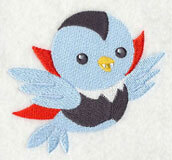 Stitch the sweet tweets on sweatshirts, t-shirts, and other apparel. 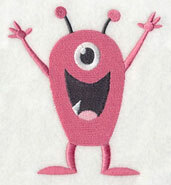 If you're new to stitching on sweatshirts, you can find helpful tip ands tricks in this Fabrics 101 article right here. 11.00" x 4.97" and 9.40" x 4.25" and 7.80" x 3.53" and 6.85" x 3.10"
Each of the birds has been separated out and are available for individual purchase. 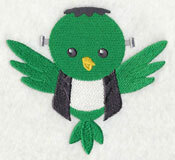 They're outfitted in classic costumes such as Dracula, Frankenstein's monster, and a witch. 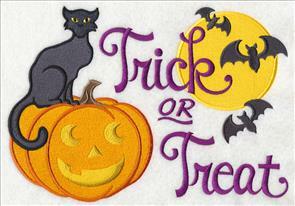 3.67" x 3.90" and 2.30" x 2.44"
Three adorable animals are in their costumes and ready to go trick-or-treating. 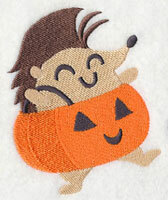 A sweet fox is dressed as a vampire, a hedgehog as a pumpkin, and a bunny as a wicked witch. 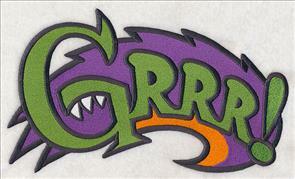 11.00" x 4.75" and 9.40" x 4.06" and 7.80" x 3.37" and 6.85" x 2.96"
Pick your favorite Halloween animal to stitch alone, or use them all! They're a great way to compliment the trio design above. 3.40" x 4.55" and 2.12" x 2.83"
Whoooo's ready for Halloween! 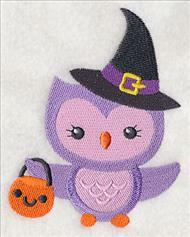 Get excited for the spookiest holiday of the year with these precious owls. 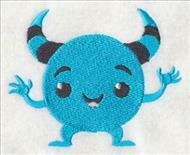 They're the perfect addition to sweatshirts and t-shirts -- learn more about stitching on sweatshirts here. 11.75" x 5.59" and 9.40" x 4.47" and 7.80" x 3.71" and 6.85" x 3.26"
These cute-as-a-button owls have been separated from the above design and are available for individual purchase. 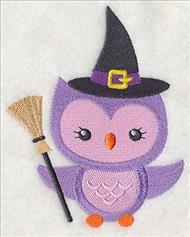 Along with pointed hats, each one has it's own witchy accent -- a wand, a broom, and pumpkin bucket. 3.91" x 5.04" and 2.28" x 2.94"
Boo! 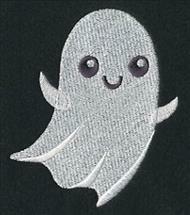 A trio of friendly ghosts is the perfect addition to sweatshirts and t-shirts, trick-or-treat bags, or other Halloween decor items. 11.00" x 4.41" and 9.41" x 3.77" and 7.81" x 3.13" and 6.86" x 2.75"
Single designs featuring each of the ghosts have been separated from the trio above and are all available for individual purchase. 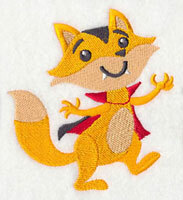 Use them to complement the trio, or stitch as stand-alone designs. 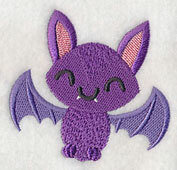 3.08" x 3.85" and 2.00" x 2.50"
Three charming bats are boo-tiful additions to a variety of Halloween embroidery projects. 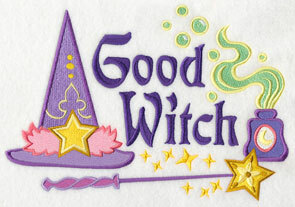 Try them on apparel, towels, aprons, quilts, and more! 11.01" x 3.55" and 9.41" x 3.03" and 7.81" x 2.52" and 6.86" x 2.21"
Each of the bats have been separated from the trio, and are available singly. Use them together with the above design for a matching set. 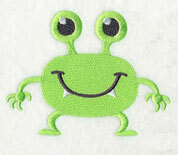 3.26" x 3.13" and 2.03" x 1.95"
These friendly monsters are a fun addition to sweatshirts, and are also fabulous on kids' gear, trick-or-treat bags, and other Halloween projects. 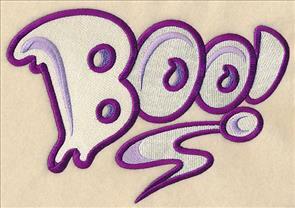 Get helpful tips and tricks for stitching on sweatshirts right here. 11.00" x 5.01" and 9.40" x 4.28" and 7.81" x 3.56" and 6.85" x 3.12"
Each of the adorable monsters are ready to be stitched alone, too. 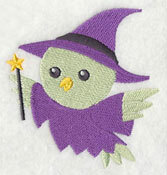 Use them in any project for a fun look -- not just Halloween! 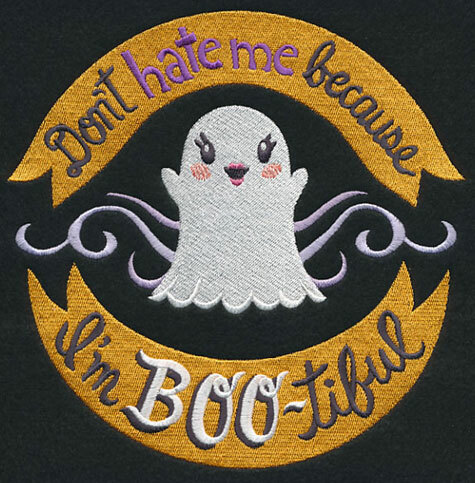 4.23" x 3.37" and 2.64" x 2.10"
Scare up some fun on Halloween with this "don't hate me because I'm boo-tiful" design. 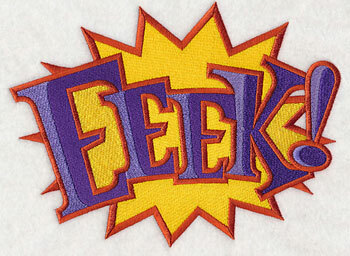 It's a too-fun addition to apparel, pillows, tote bags, and more. 7.76" x 7.81" and 6.89" x 6.94" and 5.85" x 5.89" and 4.83" x 4.86" and 3.90" x 3.86"
Kids and adults alike with love this "un-boo-lievably" adorable design. 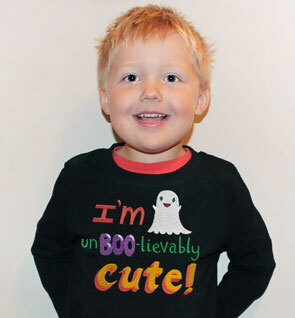 It's the perfect addition to kids' gear this Halloween! 7.80" x 6.80" and 6.72" x 5.86"
5.57" x 4.86" and 3.87" x 3.36"
Bring even more Halloween fun (and Halloween puns!) 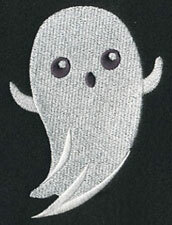 to your embroidery with these "Boo-Who!" 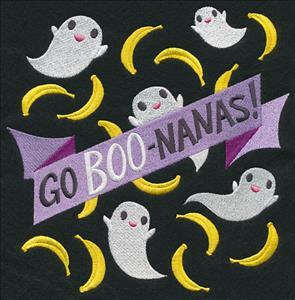 and "Go Boo-nanas!" designs. 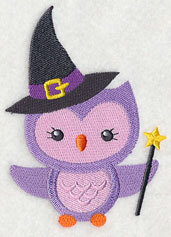 They're adorable additions to trick-or-treat gear, apparel, and more. 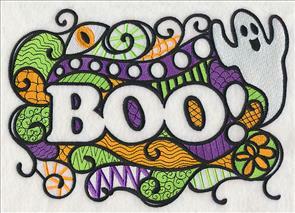 5.84" x 5.87" and 4.84" x 4.86"
7.80" x 7.80" and 6.84" x 6.85"
Grrr, boo, eeek -- Halloween is full of spooky sounds! 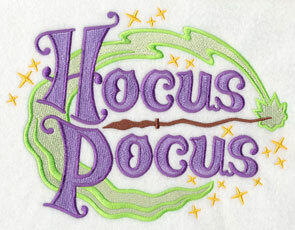 Add these spooktacular sound pops on your October 31 projects for an eye-catching look on totes, shirts, and more. 9.41" x 5.63" and 6.86" x 4.11"
8.27" x 5.84" and 6.84" x 4.83"
3.90" x 2.76" and 2.52" x 1.78"
7.81" x 5.74" and 6.54" x 4.81" and 3.90" x 2.87" and 2.52" x 1.84"